Q. What is the difference between 80mm and 60mm waves? A. The spacing determines the depth of the wave. On an 80mm wave the gliders are spaced 8cm apart and on a 60mm wave they are 6cm apart. An 80mm wave gives a deeper wave (but fewer waves) and a 60mm wave gives shallower waves (but more of them). Q. Should I go for an 80mm or 60mm wave? A. This really comes down to personal preference but there are some considerations to take into account. If you are limited space wise (front to back) a 60mm wave requires less space. Please see the Silent Gliss chart below that shows the space required for each option. If you want to achieve the slimmest stack back, or space is limited to the side of your window or door, you may wish to consider an 80mm wave. Likewise if you want your curtain to allow as much light into your room and not overhang the window (or door) an 80mm may be the preferred option. 60mm waves can look better on smaller windows as you get more of the wave effect as you get more ‘waves’ with the 60mm option. Q. What are the stackback dimensions for a wave curtain? A. An approximate stackback on an 80mm wave is 18cm per metre, and on a 60mm wave it is 23cm per metre. Q. What does hook spacing mean? A. Hook spacing determines the amount of fabric used and the fullness of the wave. The number refers to the number of pockets in between each curtain hook, so the further apart the hooks are positioned the more fabric is required for your wave curtain. On a 60mm wave the hook spacing option is either 10 or 12. 12 gives the fullest curtain width. On an 80mm wave the hook spacing options are 14 or 16, with 16 giving the fullest curtain. 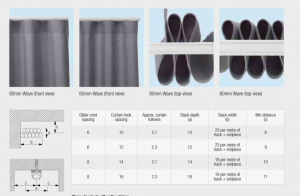 Please see the below diagram that shows you the different options and curtain fullness for each option. Q. How do I know what my curtain width it? A. The number of gliders on a wave curtain track is determined by the track length so the amount of fabric used is calculated from the track width. If you are making your curtains yourself once you know your track length you can use the Silent Gliss wave calculator (click here to download) to determine how many gliders will be on the track. Simply select the track you require, if you have a pair of curtains (P) or a single (S) curtain, 80mm or 60mm and the hook spacing and the calculator will work out the glider quantity and number of pockets per curtain. There are approximately 50 pockets per metre so you can work out your fabric requirement. If we are supplying your curtains we will work out the fabric quantity for you from the track length. Q. How do I work out the track length? A. Again there is no right or wrong and this really comes down to your window / door, space around it, where you want your curtains to sit and the look you want to achieve. If you are fixing the track wall to wall or in a recess we recommend you take the wall to wall measurement and deduct 10-15mm (this is just to be on the safe side to ensure the track fits). If you aren’t fitting wall to wall as the stack back is a calculated measurement you can play around with track lengths to ensure the track is long enough for your curtain to clear your window or door (if this is the look you want to achieve). Q. What is included with my track purchase? A. If you purchase a Silent Gliss curtain track from The Home Of Interiors we include everything you need to put the track up. The end stops, end caps, gliders and brackets are all included. There is also a square smart fix bracket available from Silent Gliss. The square smart fix brackets are more expensive but are less visible so offer an aesthetic advantage. They also offer a solution if you are limited on space to fix the standard brackets. For an optimum solution we can supply standard smart fix brackets for the end(s) of the curtain track as these will be hidden by the curtains, and square smart fix brackets for the track that is exposed when the curtains are open. Please note however that the standard smart fix brackets offer better support so are required for the end(s) if your curtains are medium weight. If your curtains are on the heavy side a couple may be needed at the end(s). Ceiling brackets: the clamp style ceiling fix bracket is supplied on the tracks. This gives a lovely flush fit to the ceiling so complements the seemless look of the wave curtain. Wall fixings: please note to ensure you have the right wall fixings for your wall construction i.e. if you are drilling into plasterboard please use specific wall fixings for plasterboard walls. There are a variety available in DIY or hardware stores. Q. Do I need any accessories? Shop curtain hooks here. Please note you don’t need any specific curtain hooks for wave curtains. The Swish or Silent Gliss nylon ones are both suitable. If you are purchasing a hand drawn track and don’t want to touch your curtains to open and close them the Silent Gliss draw rods are a popular accessory. Please select a draw rod carrier (please see image below) with your track purchase and this will be supplied on your track and the draw rod will clip onto this. Shop Silent Gliss draw rods here. Q. What is an adjustable brake? A. An adjustable brake is only available on a hand drawn wave track and keeps the curtains stacked back neatly so you get a nice, clean line on the leading edge of the wave curtain when they are opened. Please see diagram below that explains this. Q.What is an extension arm carrier? A. An extension arm carrier is only available on a corded wave track and is required on a track that will be supplied in 2 halves, or on a track for a single curtain. The extension arm ensures the curtain covers the connecting piece (when the track is supplied in 2 halves) and goes right to the end of the track for a single stack curtain. Please see diagram below. Q. What is meant by enhanced wave? A. Enhanced wave simply refers to the ‘add on’ of a draw rod carrier, adjustable brake or extension arm carrier (please see above). I hope this answers all of your questions but please do get in touch if I have missed anything or if you’d like to have a chat about your requirements. Please email sales@thehomeofinteriors.co.ukor call us on 01590 615775.